surfing images : 1870 to 1890. DelaVega (ed, 2004) Page 29. 1872. 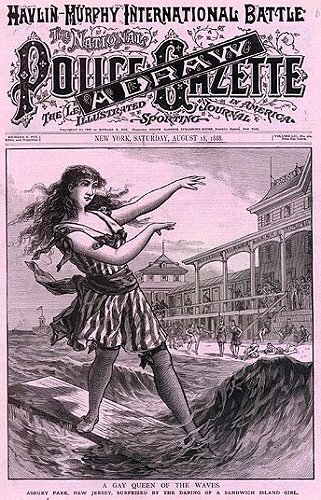 Anonymous : Surf-bathing Success, 1872. 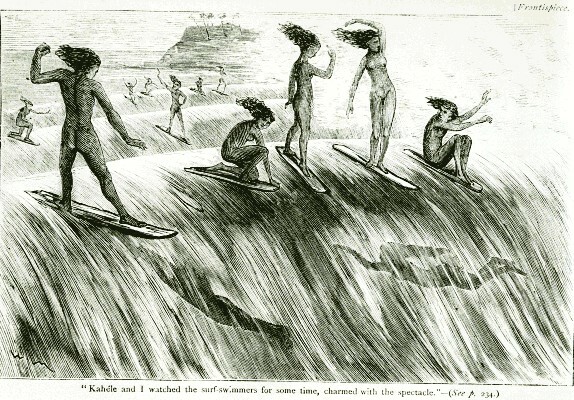 Anonymous : "Surf-bathing Success", 1872. Twain, Mark : Roughing It. American Publishing Company, Hartford. 1872. F.G. Gilman and Co. Chicago. 1872. G. Routledge and Sons, Lonon. 1872. "Fully illustrated by eminent artists". "I will write a book that will sell like fury," MT wrote Bliss in August 1870, "provided you put pictures enough in it." When published in February 1872, Roughing It contained 304 pictures. Less than three quarters of that total, however, were originally intended for MT's book, and when it wound up selling fewer copies than he'd expected, the illustrations were the first thing MT blamed. The pictures were drawn by perhaps as many as a dozen different artists. As Beverly David tells the story in Mark Twain and His Illustrators, Bliss initially hired Edward F. Mullen, whom MT had recommended in 1870 for his Burlesque Autobiography; Mullen's "E.F.M." is visible on about half a dozen illustrations. When illustrating began in the summer of 1871, anxieties about Mullen's reliability led Bliss back to True Williams, the principal illustrator for Innocents Abroad; the majority of signed illustrations in Roughing It have Williams' "TW" on them. MT's lateness in sending in manuscript and reports of Williams' drinking then prompted Bliss to commission additional pictures from Roswell Morse Shurtleff. You'll also see the name "Richardson" on several illustrations; he was an engraver -- the artist behind the pictures with his name of them was Henry Stephens. Stephens's drawings, however, were originally drawn for an entirely different book: another of Bliss' publications called Beyond the Mississippi, by Albert Richardson (1869). Excerpt from Roughing It - Finney and Houston (1966) Appendix D Pages 100 - 101. Finney and Houston (1966) Page ?? Finney and Houston (1996) Page 61. Margan and Finney (1971) Page 24. 1872. Anonymous : Surf-bathing Failure. 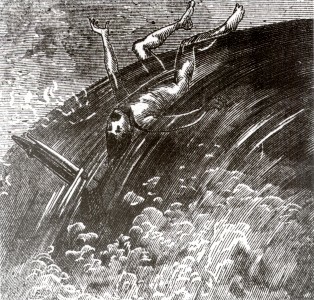 Anonymous : "Surf-bathing Failure", 1872. Finney and Houston (1966) Page ?? Lueras (1984) Page 51. Margan and Finney (1971) Page 22. Finney and Houston (1996) Page 60. Credited as "Woodblock by Commander William Bainbridge Hoff (of the flagship California)." The California made two trips to Hawaii in 1871-1872 and 1872-1873. Bainbridge Hoff may have been on either or both visits, but I can find no record of his service or rank for this period. The first 'California', a screw sloop, was launched 3 July 1867 as 'Minnetonka' at Portsmouth Navy Yard; sponsored by Miss M. Bailey; renamed 'California' on 15 May 1869; and commissioned 12 December 1870, Captain J. M. B. Glitz in command. As flagship for Rear Admiral J. A. Winslow, commanding the Pacific Fleet, she steamed from Mare Island Navy Yard 28 November 1871 for a cruise to Honolulu, Hawaii; Valparaiso, Chile; and Panama, Colombia, putting back into San Francisco 13 November 1872. On 'California's' second cruise, 30 December 1872 to 25 May 1873, she flew the flag of Rear Admiral A. M. Pennock, commanding the North Pacific Station, and sailed to Honolulu to supervise the protection of American interests in the then independent island group. It depicts Philadelphia under attack by gunboats off Tripoli, after she ran aground on uncharted rocks while chasing a small enemy vessel. Examples, Conclusions, and Maxims of Modern Naval Tactics. "General Muster" on board, circa 1887-88. The ship's Commanding Officer, Commander William Bainbridge Hoff, is in center, leaning on the grating rack. Note Marine sentry at the gangway, hammock stowage, and large percentage of black sailors among the crew at left. William Bainbridge Hoff came from a family with strong naval traditions, the grandson of William Bainbridge..
William Bainbridge was born in Princeton, New Jersey, on 7 May 1774. He went to sea in the merchant marine in 1789 and was captain of a ship before reaching the age of twenty. Bainbridge was commissioned as a Lieutenant in the U.S. Navy in August 1798. Commodore Bainbridge was commander of Navy forces afloat at Boston for much of the rest of the decade, and in 1820-21 flew his flag in the ship of the line Columbus during another Mediterranean cruise. He was later Commandant of the Boston Navy Yard, served as a Naval Commissioner in 1825-1828 and then was Commandant of the Philadelphia Navy Yard. Bainbridge returned to the Boston command in 1832,"
This web page also includes details of four USNavy ships named 'Bainbridge'. Nordhoff, Charles : "Hawaii Dei"
Harper's New Monthly Magazine, August 1873, Pages 382 to 402 (?). Harpers and Brothers, New York, 1874. Pages ? Harper & Brothers, New York. 1889. Page 32. Note the publishers are the same as Nordhoff and they probably sourced the image fom the previous publication. The scanned image is from Knox (1888) Page 32. DelaVega (ed, 2004) Page 24. Probably reconstructed from reports or sketches. I can find no record of Bayard or Riou, the other illustrator of "Voyage Aux Iles Sandwich (Iles Havai)" visiting the Hawaiian Islands. Without further confirmation, it appears both these images are not from personal observation, but possibly based on oral and/or written reports. The artist may have also access to previously published images, unpublished sketches or highly improbably, photographs. There are some similarities with Howard (1830), particually the attire. The side pespective is unique, the wave detail possibly influenced by Japanese woodblock prints. See The Wave in Art. The steepness of the beach and the significant backwash do not confirm to what modern surf-riders would normally regard as suitable surf conditions, especially for boards of this length. The boards dimensions are approximately 9 feet long and 18 inches wide. The image appears to only indicate the nose profiles, and these do not correspond with any other images , or indeed with any known examples. Similar nose profiles did not appear in common surfboard design until the 1930s. The weight of the boards is indicated by the two riders lifting the board, right. 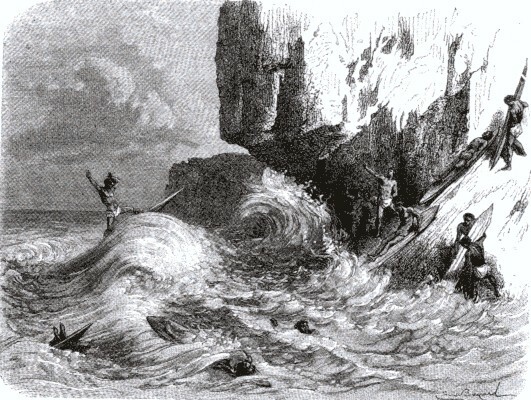 The image is as dominated by the dramatic cliff-face as much as the surf-riders. Although the riders positioning is unfortunate, this is typical of many images of this period. The image records community activity and possibly off-shore winds. It is unclear whether the two riders onshore are merely watching the action, or possibly sliding down the beach into the water. Emile Bayard was born in La Ferté-sous-Jouarre in 1837. Cogniet's pupil, he published cartoons in newspapers since he was only 15, sometimes under the pen name of Abel de Miray. He made several drawings on wood using graphite. Emile Bayard drew also posters and boards. As illustator, he never used photographic documents and always tried to have a meeting with the author. The real success of illustration should be that the reader, just by looking at the paintings, understands the book. Bayard made some drawings on current events, such as Victor Hugo's death. He actively collaborated with "Bibliotèque des merveilles", published by Hachette. He died in Cairo in 1891. Alphonse Daudet : Immortel, 51 illustrations. Hector Malot : Sans famille, Hetzel. Comtesse de Ségur : L'enfant du guide, Hachette, 60 illustrations. Jules Verne : From the Earth to the Moon, Hetzel." de Varigny, Charles : "Voyage Aux Iles Sandwich (Iles Havai)"
Le Tour du Monde (A French magazine) Volume II, 1873, Page 224. Le tour du monde. Nouveau journal des voyages, illustré par nos plus célèbres artistes. 8ème année, 1er et 2e semestre. En 2 volumes. Margan and Finney (1971) Page 14. "Jeux Havaiens" (Hawaiians playing), circa 1873. 1873. Riou : Jeux Havaiens #2. E. Riou :"Jeux Havaiens" (Hawaiians playing), circa 1873. Le Tour du Monde Volume II, 1873, Page 237. "Edouard Riou (1833-1900) is the first and undoubtedly the most recognized illustrator of Verne’s Voyages Extraordinaires. He illustrated Verne’s earliest and most famous novels, including Cinq semaines en ballon, Voyage au centre de la terre, (#19), Les Voyages et aventures du capitaine Hatteras, Les Enfants du capitaine Grant [The Children of Captain Grant, In Search of the Castaways], as well as the first eleven chapters of Vingt mille lieues sous les mers (the remaining chapters were done by Alphonse de Neuville). Before and after his association with Hetzel, Riou specialized for many years in landscape painting and commemorative pieces (the opening of the Suez Canal, the marriage of the Russian tsar’s daughter, etc.). A student of the famous French artists Daubigny and Gustave Doré, he was very well known in France during the 1850s, 60s, and 70s, and he contributed illustrations to a wide variety of French books and popular magazines throughout this period—e.g., Dumas’ Le Comte de Monte-Cristo, Scott’s Ivanhoe and Waverley, Hugo’s Notre Dame de Paris and periodicals like Tour du monde, Illustrated Times, and La Chronique illustrée. " SCIENCE-FICTION STUDIES, XXV:2 (July 1998): 241-70. Leuras (1984) Page 52, notes that that the illustration has "a Tahiti-like backdrop". Furthermore, there are several standing riders apparently riding away from the beach. Kampion (1997) Page 42 - 13 (cropped). The original French edition of “In Search of the Castaways” was published by Hetzel in 1867-1868 as “Les Enfants du Capitaine Grant” (The Children of Captain Grant). It included 170 engravings by Edouard Riou which are also present in this 1873 English-language edition. 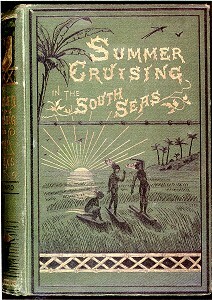 Summer Cruising in the South Seas, 1874. Cover illustration, probably by Wallis McKay. First book with a surf-riding illustration on the cover. 1874. Stoddard : Cruising the South Seas. Book cover. Cover illustration by Wallis McKay. Stoddard, Charles Warren : Summer Cruising in the South Seas. Chatto and Windus, London. 1873. Also Dela Vega (ed, 2004) page 28. Highly detailed image denoting riding positions, stance, duck-diving, waves in sets, off-shore winds and significant wave height. Wallis McKay :Surf-swimmers, circa 1874. ... 'Punch' and its Irish version, 'Zozimus' (which employed Wallis Mackay as its chief cartoonist). Zozimus The Irish equivalent of Punch, with many humorous stories. Finney and Houston (1996) Page 36. Dela Vega (ed, 2004) Page 31. Wallis McKay ? : Surf-swimmers, circa 1874. Wallis McKay : "Surf-swimmers, circa 1877." 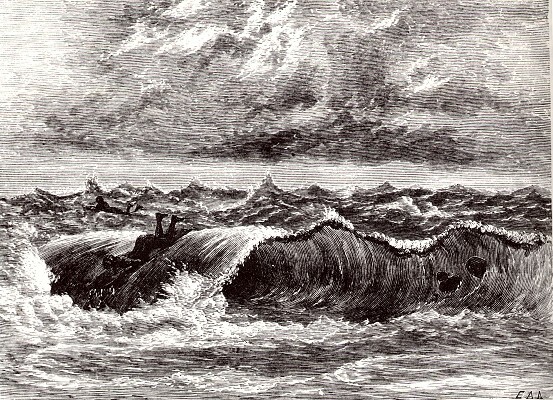 A highly detailed image denoting riding positions, stance, duck-diving, waves in sets, off-shore winds and significant wave height. Wood, John George (1827-1889) : The Uncivilized Races of Men in all Countries of the World : Being a comprehensive account of their manners and customs, and of their physical, social, mental, moral and religious characteristics. G. Routledge and Sons, London. 1868-80 2 Vol.Pages 168 to169. Nat's History (1983) Page 30. Finney and Houston (1966) Plate 10. Margan and Finney (1971) Page 18. Dela Vega (ed, 2004) Page 30. 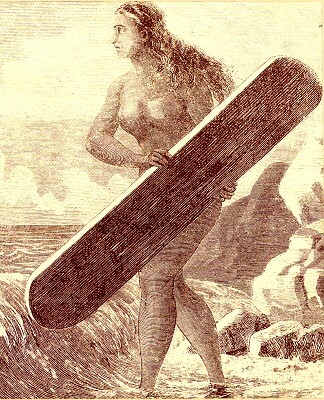 Wahine and surfboard, circa 1875. Nat's History (1983) Page 18. DelaVega (ed, 2004) Page 22. 1875. Jay Charlton : "Natives Bathing In The Surf Near 'Newport' Three Miles From Honolulu, Towards Diamond Head, circa 1875." "King Kalakaua at Home" 23 January 1875. Pages 333 - 334. 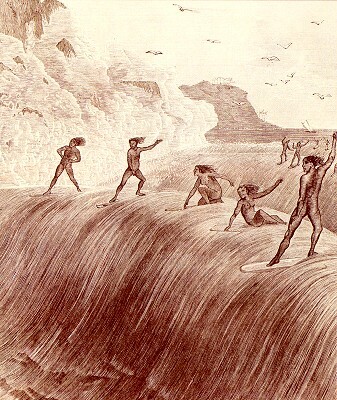 Reprints Ellis's report of surf-riding, 1820 and the image by Jay Charlton. "King Kalakaua at Home" 23 January 1883. Pages 333 - 334. "Leslie's Illustrated Newspaper (1855-1922) was the first successful American venture to bring pictures and news together in a weekly. Leslie's career coincided with the rise of photography, a technological achievement that increased the public appetite for pictures. But the camera was little help for publishers during Leslie's life since there was no mechanical way to bring a photograph to the printing press. Thus magazine illustrations were done by hand. Leslie's breakthrough was in dividing the engraving into as many as thirty-two sections for individual engravers and then fitting the woodblocks together so that the seams fit. He could accomplish in a day what a single artisan had taken weeks to produce. Using these teams of engravers, he published pictures of events only a week old, a speed new to popular journalism. On December 14, 1855, he published the first number of "Frank Leslie's Illustrated Newspaper," in which his ideas of a pictorial newspaper were indicated by illustrations of Dr. Kane's arctic expedition that attracted wide attention." HUNTING/FOX HUNTING/COLOUR - 'SKETCHES IN THE HUNTING FIELD NO. II - THE RIVALS'. This splendid Double Page, which appeared in THE GRAPHIC in 1879, depicts ladies riding side-saddle. It was issued in Colour and drawn by J. Charlton. Illustrite Welt 1887. Volume XXVI. : "Das baben in der Branbung" Page 56. The Evening Bulletin published Alexander Hume Ford's first extensive article on surfriding, "Riding Breakers", on 17th July 1908. The brief introduction; at school in South Carolina, an illustration in his geography book invokes dreams of surfriding; almost reads like fantasy. 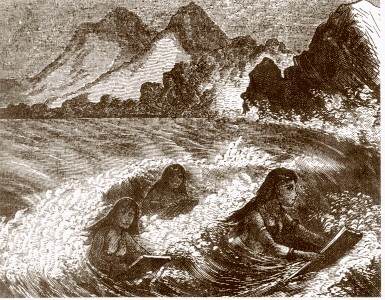 An etching of a Polynesian beach scene apppears in William Swinton's Grammar School Geography, published in 1881. That year Ford would have been about twelve years old and probably was in school. 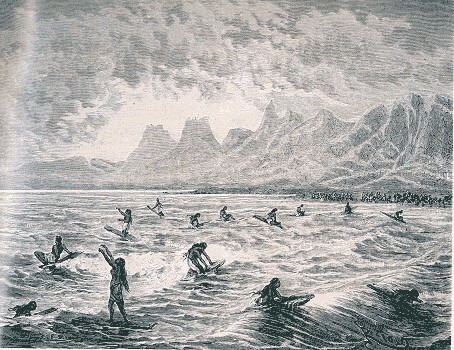 Significantly, the illustration also depicts Polynesians in repose on the beach in front of two grass houses, with a large mountain in the distance. Photographs of the first buildings on the Outrigger site at Waikiki bear a remarkable similarity, see below. A. R. Gurrey Jr.:Taking It Easy. Surf Swimming off the Coast of Hawaii. Woodcut and design by Harden S. Melville. 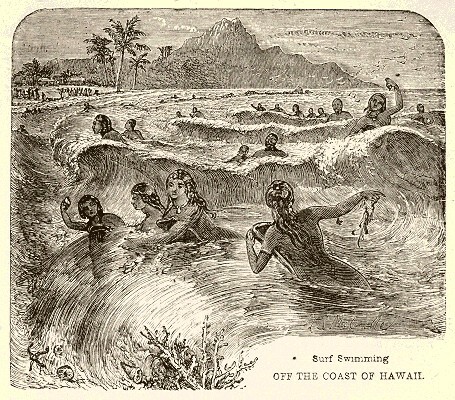 1885 Harden S. Melville: Surf Swimming off the Coast of Hawaii. Ward, Lock, and Co., Warwick House, Dorset Buildings, Salsbury Square, E.C. The image is probably not based on observation, and is most likely a copy of "Surf swimming at Hawaii, Sandwich Islands." Leslie's Illustrated Weely, New York Arkell Weekly Co. 7 April 1866. Page 37. August 18, 1888, pages 1 and 14.